EditPad Pro is a powerful and versatile text editor or word processor. Designed to make text editing as convenient as possible, using EditPad Pro to edit text files will save you a lot of time and frustration. EditPad is available in many languages, including Russian. EditPad Pro has a lot of functionality that makes editing text files more convenient for you. A lot of this does not sound very impressive or even works behind the scenes, but you will surely appreciate it when you need it. These are only a small number of EditPad Pro's many little features that make heavy text editing a breeze. EditPad Pro can edit text in any script supported by Windows, including right-to-left scripts such as Hebrew and Arabic and complex scripts such as the Indic scripts. EditPad Pro can also force left-to-right text to be strictly monospaced, even when using a font that isn't monospaced, so your columns always line up perfectly. If you need to type in some special characters not available on your keyboard, you can use EditPad Pro's character map to quickly insert them by double-clicking on them. Easily insert special symbols like the trademark or copyright symbol into your documents, or enter letters from a foreign script that your keyboard does not support. If you save your files as Unicode files, you can use any character known to humanity. EditPad Pro edits all text files. Open text files saved on Linux, UNIX and Macintosh computers, or even text files from old DOS PCs or IBM mainframes. EditPad Pro preserves the file's compatibility with those systems, unless you explicitly convert it. You'll never have to worry about being unable to open a text file, and you'll always be able to save your files in a format that people with less flexible text editors can read. EditPad Pro handles DOS/Windows, UNIX/Linux and Macintosh line breaks. Open and save text files encoded in Unicode (UTF-8, UTF-16 and UTF-32), any Windows code page, any ISO-8859 code page, and a variety of DOS, KOI8 and EBCDIC code pages. Convert files between any of these encodings. With EditPad Pro you can easily open and edit many text files at the same time. There's no limit. Arrange text files into multiple projects to open them at once and edit them together. Open all files in a folder (and its subfolders) into a project. Many of EditPad Pro's editing commands can work on all files in a given project at once. Quickly switch between files and projects by clicking on their tabs. Move back and forth with the handy "previous editing position" and "previously edited file" commands. Manage long lists of text files and large projects with the handy file manager sidebar which can rename, move, copy and delete files. You can make sure you're writing with proper spelling by using EditPad Pro's spell checker. Word lists are available in many languages. You can tell EditPad Pro to point out misspelled words in the current file, current project, all open files, or just the selected text. Turn on Live Spelling to make EditPad Pro highlight misspelled words as you type. 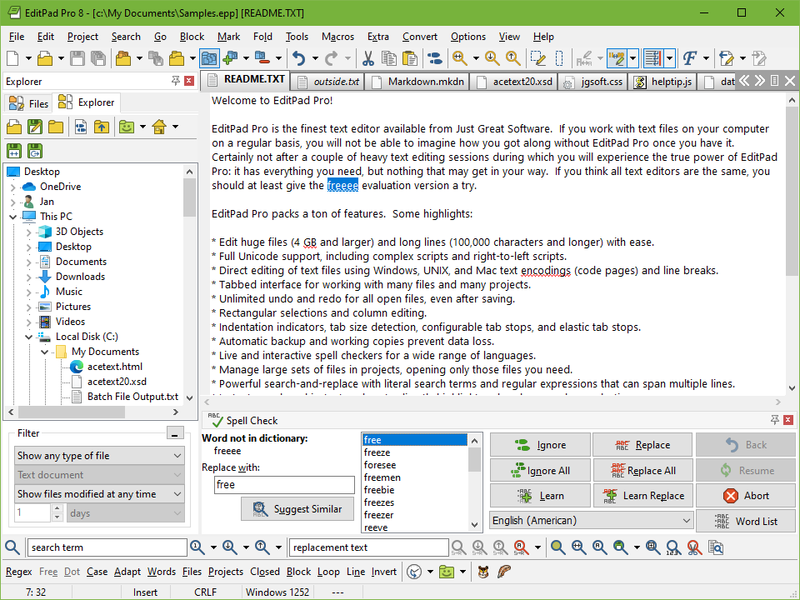 EditPad Pro sports one of the most extensive search-and-replace features of any text editor. Quickly find the part of the file you want to edit. Highlight matches, fold lines, and skip over matches and files. Instantly make many replacements throughout a (rectangular) selection, file, project, or all files in all projects. Use regular expressions and adaptive case options for powerful and dynamic search terms and replacements. Clever use of EditPad Pro's search-and-replace can automate much tedious editing. Record and play back keystroke macros to reduce repetitive tasks to a single key combination. Record a search as part of a macro to instantly edit all search matches in any particular way. Save any number of macros to build your own library of high-octane text editing wizards. EditPad Pro's syntax highlighting is fully configurable. You can change the colors to mimic the CodeGear or Visual Studio IDE, or choose your own colors. 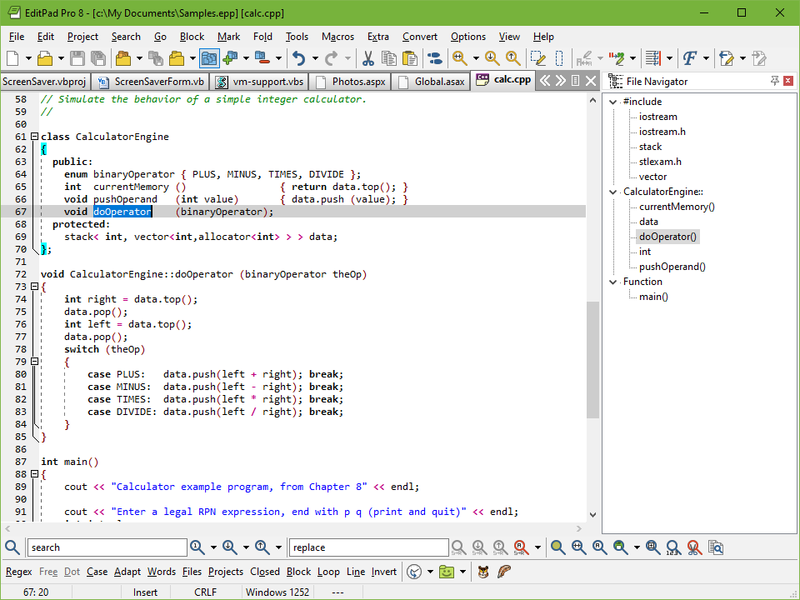 EditPad Pro ships with large number of syntax coloring schemes, all of which are fully editable. EditPad Pro's File Navigator can show you a detailed layout of the file's structure. Use it to instantly jump to the relevant part in the file. A large number of file navigation schemes for various programming languages and other file formats are included. All file navigation schemes are fully editable. You can create schemes to visualize the layout of almost any kind of file. The schemes can also make various blocks of text foldable with a single click. By folding blocks you can hide lines to get a better overview of the file's structure, making it easier to rearrange blocks of code or navigate between them. EditPad Pro's Clip Collection makes it easy to keep a list of text snippets at your fingertips, ready to be inserted into the file's you're editing. Such a snippet can be a word, phrase, three paragraphs, half a book, or anything you want. Clips can consist of "before" and "after" parts to be inserted around a selection. Use EditPad Pro's built-in FTP and SFTP client to upload your web pages and scripts to your web server right within EditPad Pro. You can even edit web pages directly on the server via FTP, without having to download the HTML files to your computer's hard disk first. EditPad Pro transfers files in the background, so you'll never have to wait for all files to download, or for a file you've saved to finish uploading. You can go on editing right away. EditPad Pro can stay connected to multiple servers. Don't worry about saving files with EditPad Pro extensive auto-save and backup options. Choose how many backup copies you want to keep and/or for how long. The File History shows you the backup copies for the current file. You can easily open and compare backups, as well as save specific milestone copies. EditPad Pro's unlimited undo and redo even allows you to undo changes after saving them. Compare any two files to get a view of the differences between two files, or check which changes were made between two (backup) copies of the same file. EditPad Pro can highlight difference, merge the two files, and extract the differences or similarities into new files. Very convenient for rolling back inappropriate changes you made to a file, or for double-checking the changes somebody else made to a file you sent them. You can easily send files via email right within EditPad Pro. Use rectangular selections to easily edit columns of text. Any editing command that works on a usual linear selection also works on a rectangular selection. Shift and insert columns left and right, move blocks up and down, fill and indent blocks, etc. Handy commands to begin, end, shrink and expand selections make it easy to work with blocks spanning many pages. Easily edit all kinds of lists with handy commands to sort lines alphabetically and delete duplicate lines. Use these commands with rectangular selections to sort and trim lists of multiple columns on one of the columns. EditPad Pro will highlight URLs (web site addresses) and email addresses in your text files. You can easily open the web site by double-clicking the URL in EditPad Pro. Of course, you can always turn this option off. When writing a report or an article that has certain length requirements, you can use EditPad Pro's statistics feature to instantly see how many paragraphs, words and letters you've typed so far. Get statistics for just the current file, or for all files in a project, or even all files in all projects. Editing an HTML file with EditPad Pro. The FTP panel is docked to the left. Editing a CSS file with EditPad Pro. The File Navigator is docked to the right. 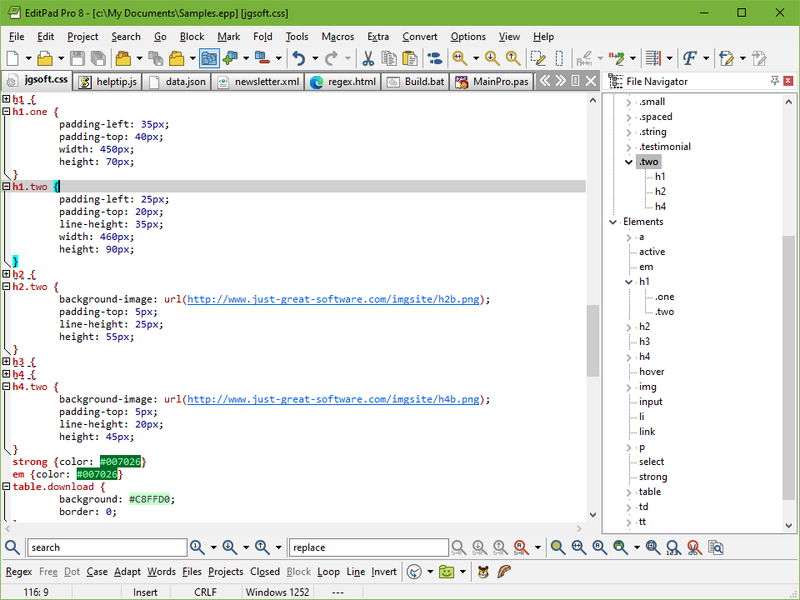 Editing a C/C++ source code file with EditPad Pro. The File Panel showing a list of open files is docked to the left. "I was just sitting here, working away and it occurred to me that EditPad Pro is one of the applications I use the most. I've been using EditPad for years - it is just a wonderful piece of software. "It is so refreshing to have an affordable program that works as it is supposed to and is full of great USEFUL features - unlike so many other products on the market today. "I just wanted to say thank you for a job well done. I don't know what I would do without it." "I bought the EditPad Pro package and I am a very satisfied user. "I am a totally blind user and this package, I think, is simply fantastic for the visually impaired users. The features such as selecting a block of text, inserting the whole text of an external file at a certain point, appending selected text to the clipboard are simply fantastic and the package has made my life no end easier which really drives me to say that it is worth every cent of its price." All EditPad Pro licenses are valid for all language editions. Though our order forms are only available in English, you will be able to download the Russian version from the Russian download page after purchasing. The easiest and quickest way to buy your own copy of EditPad Pro is online with your credit card. Our online purchase form has been fully secured with strong 128-bit encryption. Your order will be processed immediately. You will be able to download and start using EditPad Pro in only a minute or two. You will also be able to print a detailed invoice for tax and accounting purposes in your web browser. If you have a PayPal account, you can buy EditPad Pro via PayPal. If you use funds from your PayPal account or credit card, you will be able to download and start using EditPad Pro immediately after the PayPal transaction. Other funding sources may take a few days to clear. If you purchased EditPad Pro on or after 16 May 2010, your license is already valid for the latest version of EditPad Pro and you can download it immediately. If you purchased EditPad Pro prior to 16 May 2010, you own EditPad Pro version 6 or earlier. You can buy version 7 at the discounted price of US$ 24.95 instead of the full price of US$ 49.95 which new customers pay. If you are not sure which version you own, simply type in your user id and email address below. If you own version 7, you will be told you can download the latest version free of charge. If not, you will be presented with the form to purchase the upgrade. Please enter your EditPad Pro user ID and your email address. If you lost your user ID, you can have it resent instantly by typing in your email address on the download page. The order form will be in English. After purchasing, you can download the Russian version from the Russian download page. If you have already purchased EditPad Pro, you can download the latest version by typing in your email address and EditPad Pro user ID below. If you lost your user ID, type in your email address and leave the user ID field blank. You will then receive an email message with your user ID. 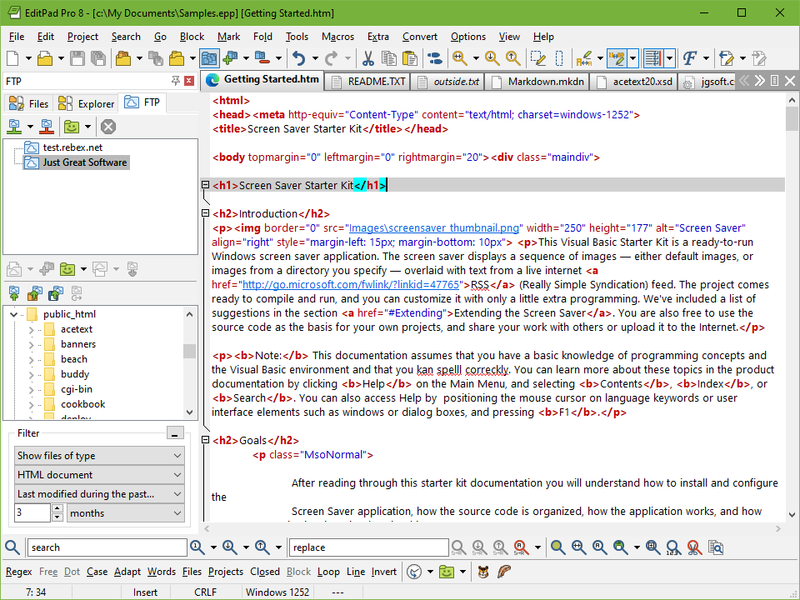 Version 6.7.1, released 20 May 2011. The download includes the EditPad Pro software in Russian. The help file and PDF manual are in English. EditPad Lite is a general-purpose text editor, designed to be small and compact, yet offer all the functionality you expect from a basic text editor. EditPad Lite works with Windows 2000, XP, Vista, 7, 8, 8.1, and 10. EditPad Lite is free for non-commercial use. That is, you may use EditPad Lite if you do not get paid, directly or indirectly, for the work you do with EditPad Lite. Registered charities may also use EditPad Lite. The download includes the EditPad Lite software in Russian. The help file is in English.